When I saw these fabric flowers in the latest issue of Marie-Claire Idées, I couldn't put down my magazine fast enough to get started. I made a whole bunch of them the same evening and while I was doing so I was thinking of the many different ways I could use them. In the original project they were used to decorate a seat cover. The flowers are really easy to make. All you do is roll and twist a fabric strip to form a flower and then secure with a couple of stitches. Instead of cutting my fabric strip I ripped it, which gives a nice frayed effect. You can find many different ways to fold flowers online. 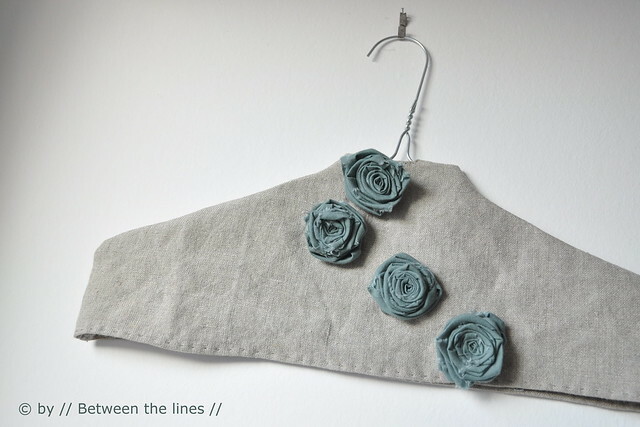 Just google "fabric roses" and you'll end up with an extensive list. This tutorial is pretty close to the way I did it. Many people use glue or secure the flower with a couple of stitches as they go. I didn't do so, but finished folding my flower first, then put a couple of pins through the back to secure, and finally sewed the "petals" into place with a couple of stitches on the back, making sure to go through all layers. You probably won't be able to go through all layers at once - just work your way around the rosebud making several small stitches. One flower takes approximately 10-15 minutes to make depending on its size. I made mine while watching, or should I say listening, TV and found it very relaxing. Once you have finished a bunch you can use them to decorate well basically anything. Here are a couple of examples. Of course I had to make a tote. 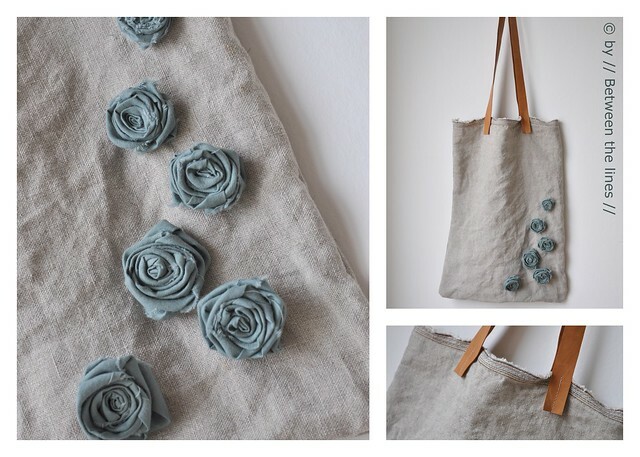 It's a basic tote, in natural linen, finished with a French seam, and with leather handles. As I liked the selvedges of the fabric - it has the same pale aqua green in it as the flowers - I didn't even bother to finish the hem. 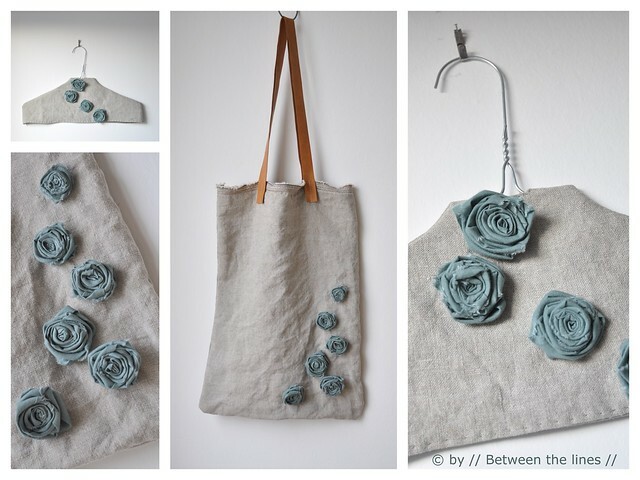 With no lining, no hems and no fabric handles to sew, this bag is a real quick one! But I love the way it turned out - the rough look of the linen and the frayed edges of the flowers combine really well, I believe. And if you thought I ran out of ideas for wire coat hanger make overs... here's just another one in my collection. This one's entirely hand sewn, as I was too lazy to pull out my machine. Fun to make and another fast DIY gift. Little H. and I also made a cute little purse together, lined with a liberty like printed fabric. 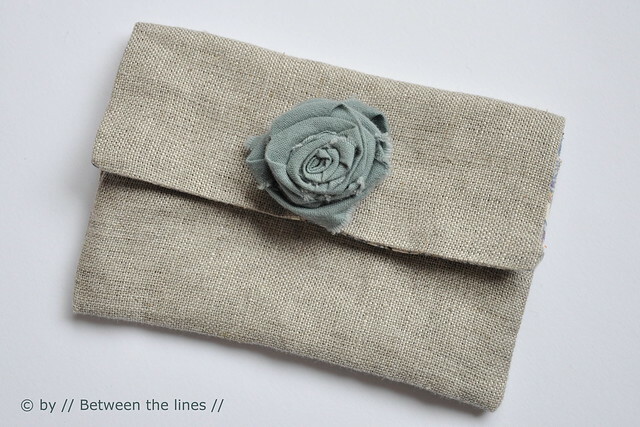 She took care of the side seams of both linen and lining and sewed on the snap closure. The result is one to be proud of, little Elf! Well done! The possibilities for these little flowers are endless. I have a couple more in mind - now I just need to find the time to work on them.